Disclaimer:Please always backup your Magento installation (files and database) before installing any of our extension so you can roll back in the event of issues. We recommend to install our extension in a testing environment before deploying it to your production environment. 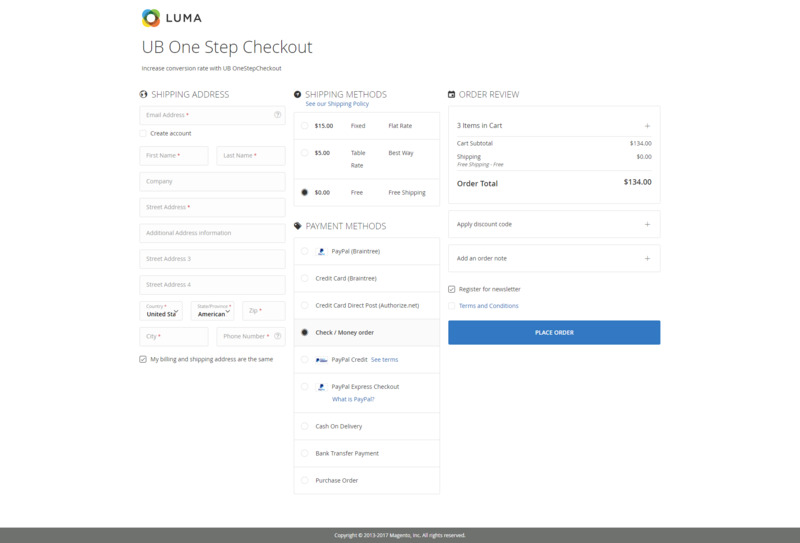 All Ubertheme extensions were tested in clean Magento installations without 3rd party extensions and we can’t guarantee for compatibility with 3rd extensions.UB One Step Checkout helps you build a one page checkout in Magento 2 easily. 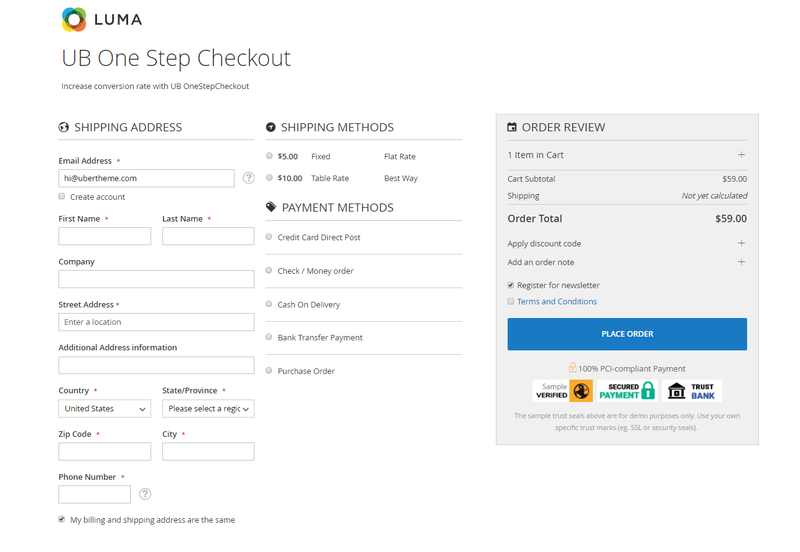 UB One Step Checkout is a premium extension for Magento 2 that allows you place all checkout steps on one page. 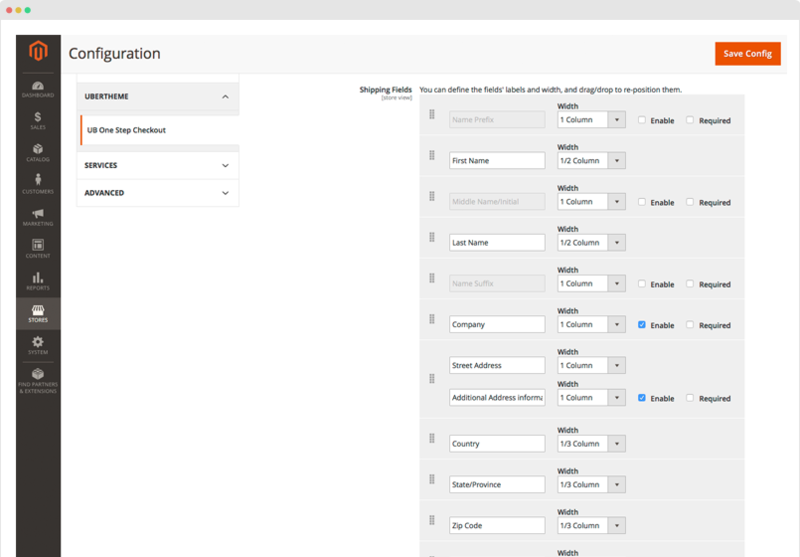 It gives you full control on checkout fields, simply drag and drop to manage your address variations. Address autosuggestion plus many other rich features will get shoppers through your checkout quicker and easier. This userguide will describe the extension installation process and how to configure all the key features of UB One Step Checkout. 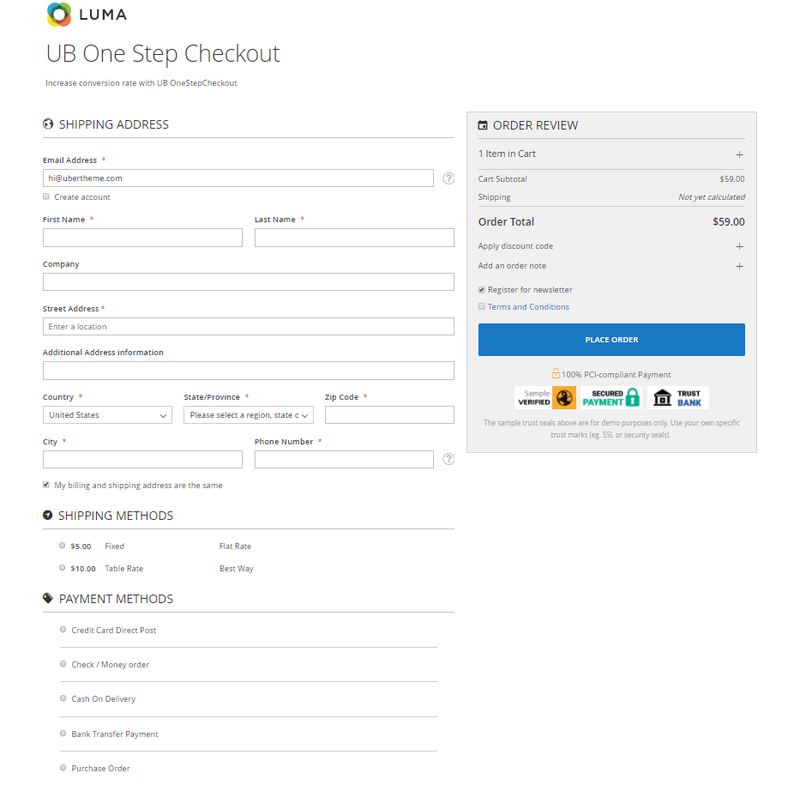 UB One Step Checkout is native with Magento 2.x. Please make sure your system meets the Magento 2 System requirements: here. Attention: When you copy the extensions files into a local directory, make sure you *merge*, not *replace* the existing folder contents, as otherwise your app folder will be gone. 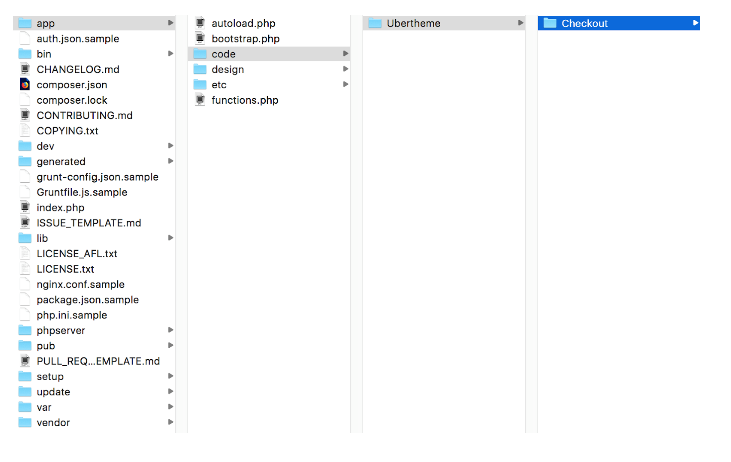 NOTE: the command php -f bin/magento module:enable -c Ubertheme_Base is required for UB One Step Checkout v1.0.7 and above. If you encounter any problems after installation, you can contact us by submiting a ticket on our forum helpdesk here for troubleshooting. 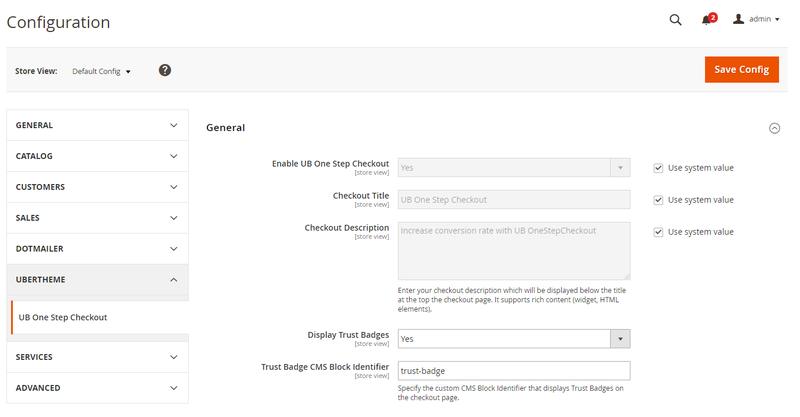 Now the UB One Step Checkout extension has been installed on your Magento 2 instance. To start using UB One Step Checkout after installation, you need to a take a few quick steps to make sure all is configured properly. Also, not all of the features are enabled by default. 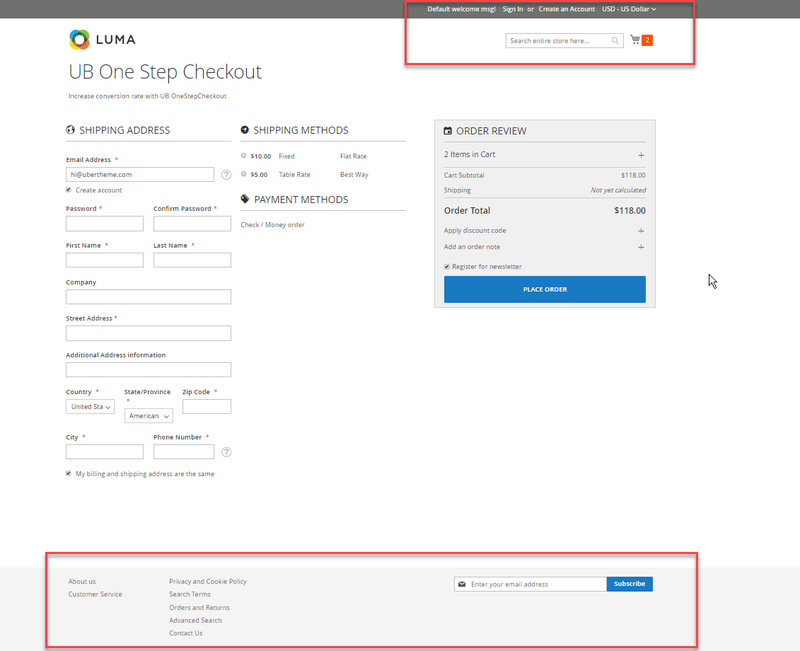 Enable UB One Step Checkout: If set to Yes, UB One Step Checkout is enabled. Checkout Description: Specify a description for your checkout page, for instance important information about taxes, payment etc. It supports rich content (widget, HTML elements). 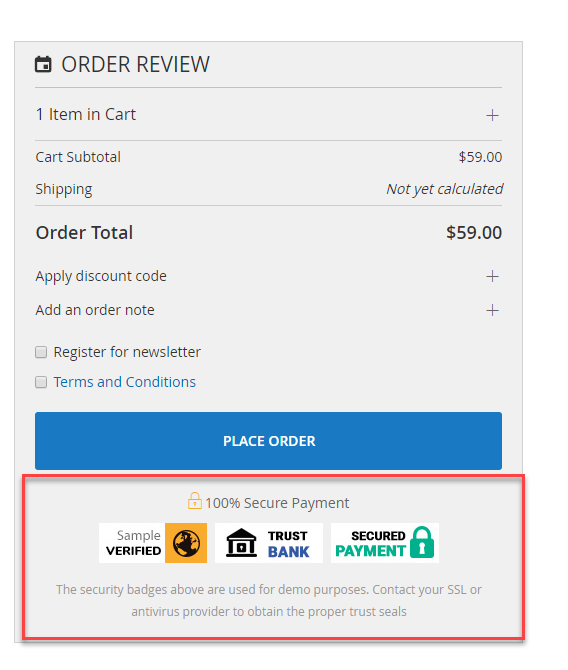 Display Trust Badges: If set to Yes, show the Trust badges in the Order Review section on the checkout page. 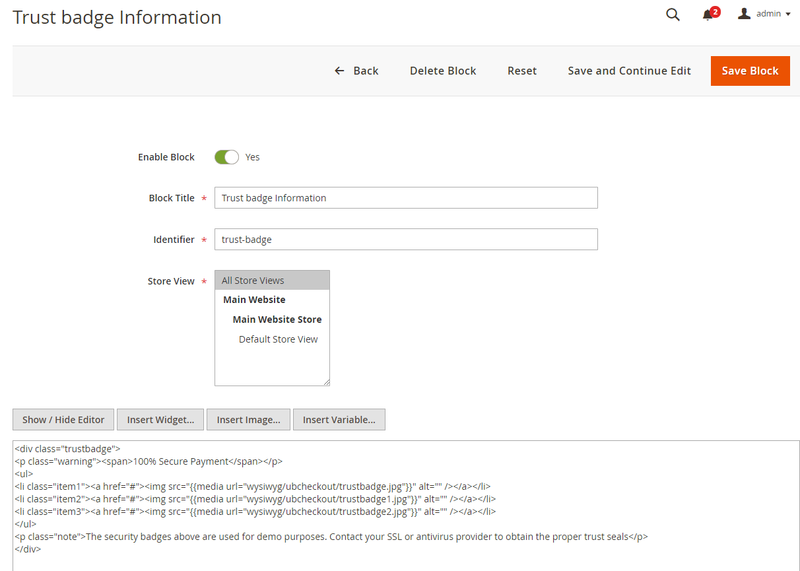 Trust Badge CMS Block Identifier : If you enable the Trust badge block, you need (1) to create a CMS block for Trust Badges, then (2) fill in the CMS Block Identifier of such custom block here to display Trust Badges on the checkout page. To create a Trust Badges block, go to Content | Blocks, click Add New Block following this sample. 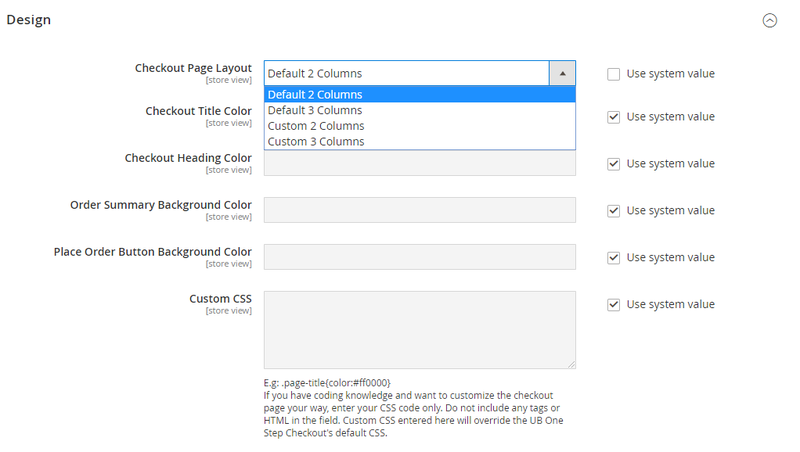 If you already have a Magento 2 theme and want all your store pages and checkout page to look the same (to use the same theme), then you can select either Default 2-column or Default 3-column layouts. If you want to use our pre-designed custom layouts, then go with Custom 2-column layout or Custom 3-column layouts. Checkout Page Layout : Flexible checkout page layout -- the number of columns: two and three columns. Refer to our note above to see when to use Default 2 / 3-column vs. Custom 2 / 3-Column layout. Checkout Heading Color: Define the custom color of your checkout page’s heading. 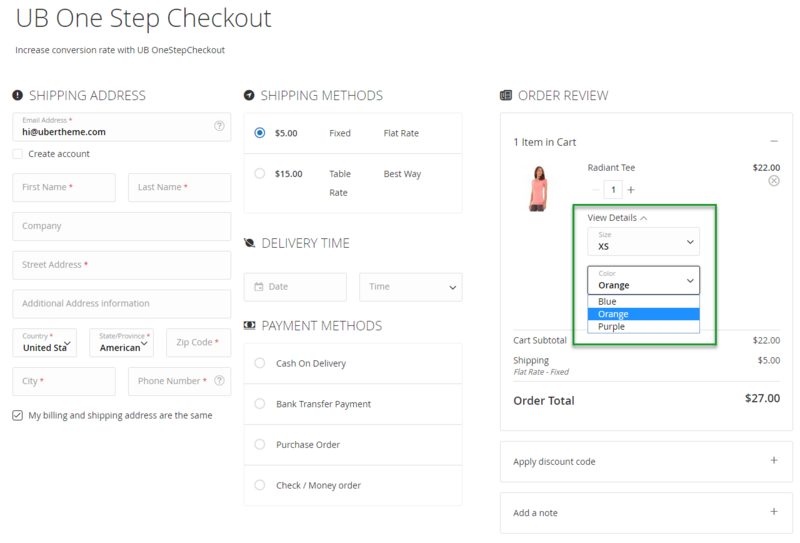 Order Summary Background Color: Define the custom color of your checkout page’s Order Summary Background. Place Order Button Background Color: Define the custom color of your checkout page’s Place Order Button Background. 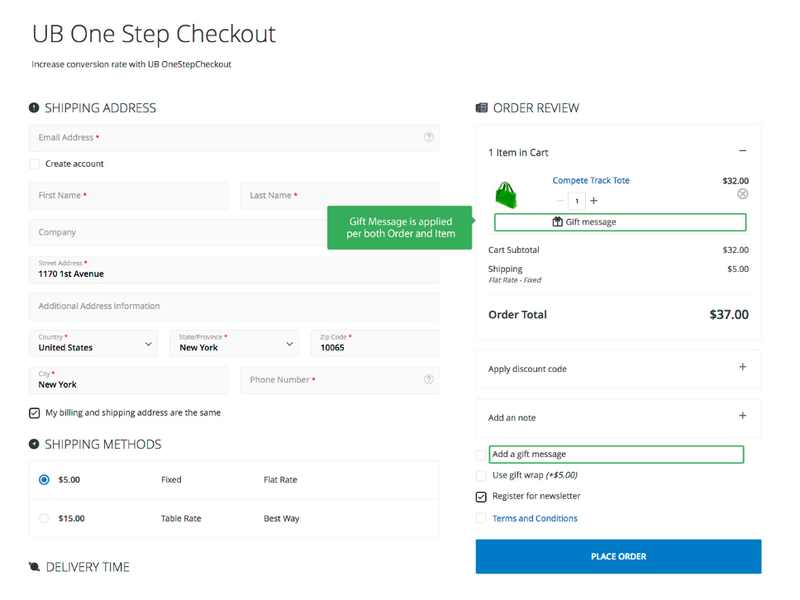 Custom CSS: Add your custom CSS styles here to override and extend the checkout page your way. If added, you just need click Save Config button, and clear all Magento and browser’s caches to apply your custom modifications. Default value for the color of title, heading, background etc, are inherited from your theme, either Luma or your 3rd party theme. The Default value settings are optional. You can specify those values that will be preselected on the checkout page by default. Shipping addresses have a commonly understood structure, however you might need to set up multiple variations of the address block. Street number comes before street name? Need a full-width input field that provides an adequate amount of room for longer answer? No problem. 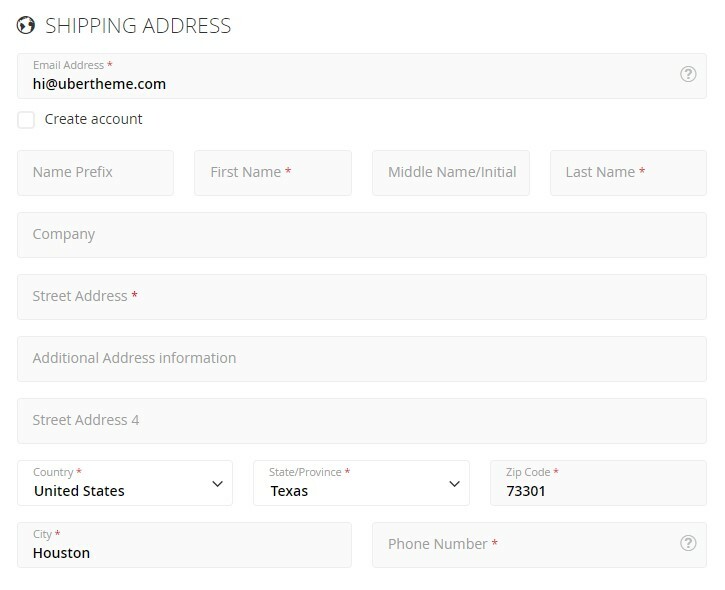 UB One Step Checkout allows you to set up multiple variations in address fields. You can easily enable/disable, check required fields and rearrange the positions of fields. You can rename label fields, change width of each field. For the rest, you have full control to set up your way. Simply define your own fields’ labels and width; specify which fields to be required or enabled. Example: If you set the width ½ column for the Country field and ½ column for the State/Provine field, then you will have both Country and State/Province fields in a row. If you set the Company field with 1 column, then it will strive to be 100% of row width. You can flexibly manage the Billing Address in the same way like the Shipping Address. 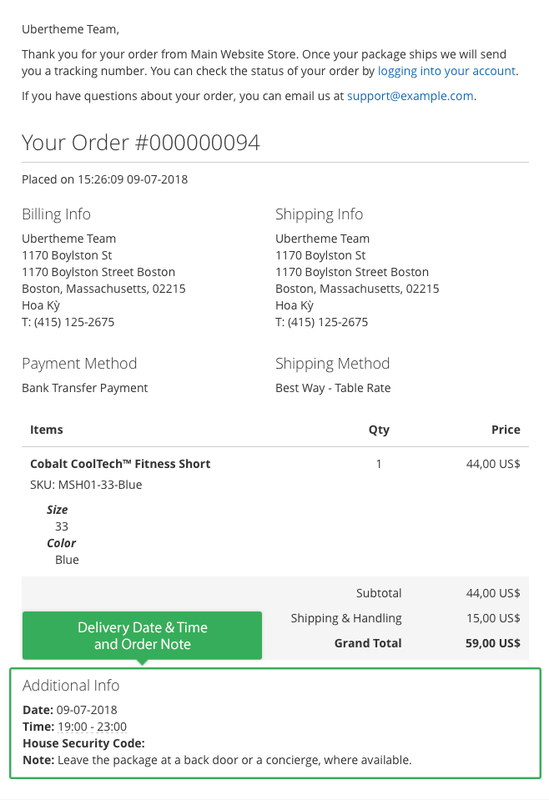 By default, UB One Step Checkout sets the billing information to be the same as the shipping information. Simply set No to the ‘Billing and Shipping fields are the same’, and configure the Billing address to meet your requirements, if you choose to. 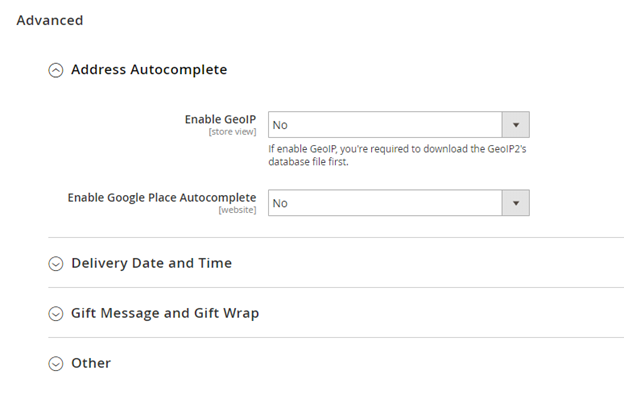 Step 1: Go to Store | (Settings) Configuration | Ubertheme | UB One Step Checkout, navigate to Advanced | Address Autocomplete section, set ‘Yes’ to Enable GeoIP. IMPORTANT: You’re required to download the GeoIP2’s database file before the GeoIP address detection is ready for use. NOTE: Magento uses Composer to manage dependencies and upgrades in Magento Open Source. If you’re new to Composer, please read more via Magento guideline and how to install Composer here. Once done, refresh your Admin panel, you should see the Download Database File button enabled. Now back to your storefront, once you add an item to cart and checkout for testing, GeoIP will automatically fill in the country, state, zip code and city based on your specific IP address. Enable Google Address Autocomplete: Set “Yes” to enable Enable Google Address Autocomplete. Google Place API Key: fill in the Google Place API key to activate Google Address Autocomplete functionality. Learn how to get the API key here. 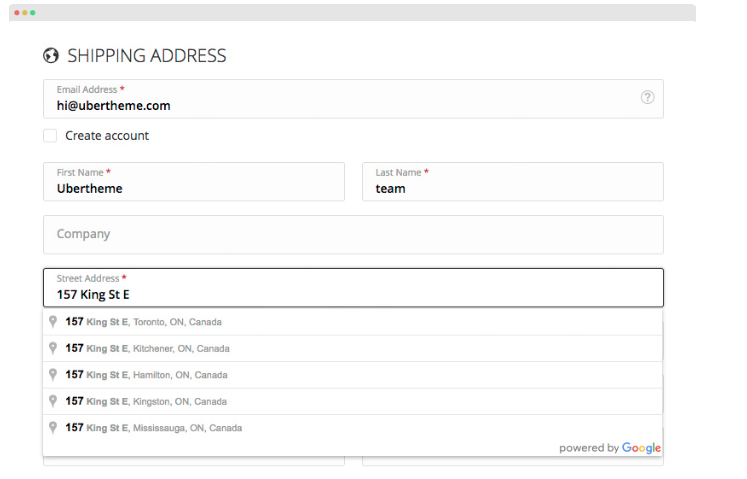 With Address Autocomplete enabled, the pick list of place predictions will be shown when the customer enters the address details. And the API will automatically find and fill the state, city respectively when the customer selects an address from the list of suggestions. Once enabled, Delivery Date & Time, Delivery Notes will be displayed in your backend sales grids/emails/PDFs. To include the Delivery Date & Time in the sales emails, make sure you check out required configuration steps in section 6.3.2 -- Include Delivery Date & Time info in the Order Confirmation Email below. If you enable the Date and Time settings, the customers can choose their preferred Delivery date and time for the order on the checkout page. Enable: Set “Yes” to enable Delivery Date and Time. Delivery Days: Select the weekdays on which you do deliver. 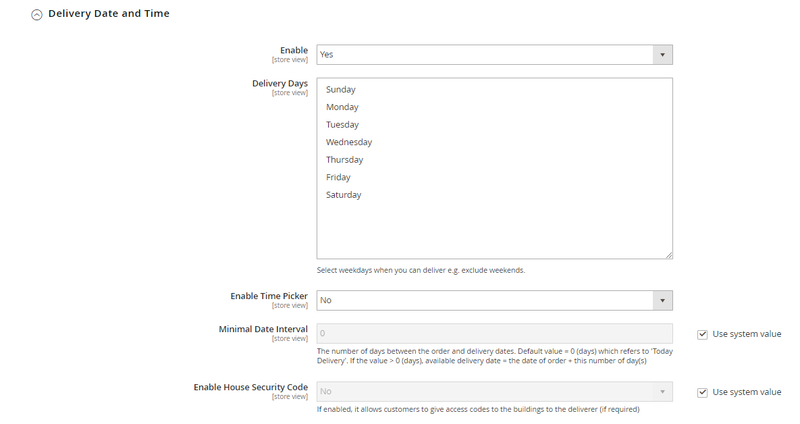 In order to select multiple days, press and hold the Command / Ctrl key, then click the days you enable for delivery. 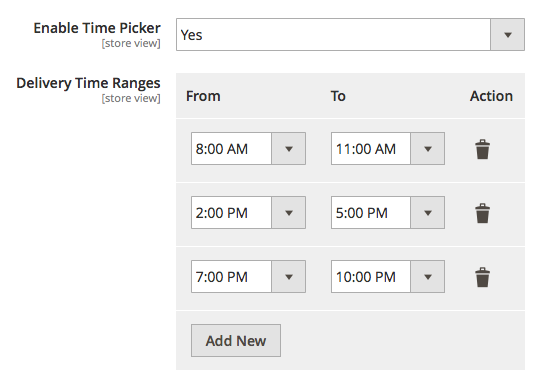 Enable Time Picker: Set “Yes” to Enable Time Picker. 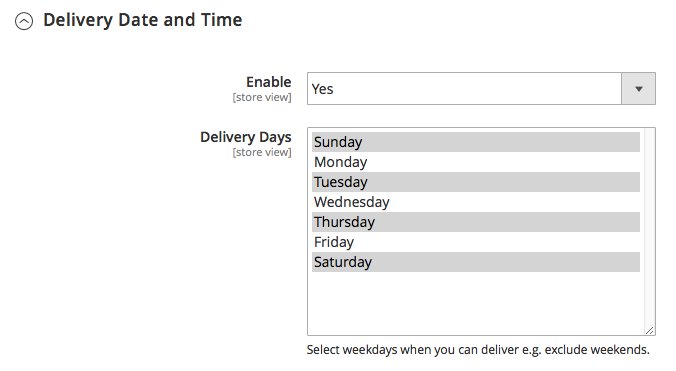 Delivery Time Ranges: Allow to set up delivery time along with the delivery date on the checkout page. Click the Add New button, then set the Start hours and the End hours for the time sliders. Once enabled, your customers can pickup a delivery slot from within such specified time range only. Minimal Date Interval:This feature refers to the number of day(s) between the order and delivery dates. If you set 1 day in the Minimal Date Interval field, your customer will see the first available date for delivery = the date of order + 1 day.That means, if a customer places an order on 8 July 2018, they can select a delivery date starting from 9 July 2018 in the delivery date calendar, and 8 July 2018 will be disabled. In oder to set up the same day delivery, just leave the Minimal Date Interval blank. Same day delivery refers to the day on which the customer places an order and want the delivery on that day itself. Delivery Note: With Delivery Note, customers can leave any other information about their order delivery. To enable Delivery Note, go to Stores | Configuration | UberTheme | UB One Step Checkout | Advanced | Other, click Order Note and select Display in Delivery Time. If Delivery Date & Time is not enabled, you can place the Delivery Note under the Order Review block instead. As a customer makes purchase in your store, Magento sends an Order Confirmation email based on your configuration to notify customer about his purchase. Assign this e-mail to the appropriate sales email. Go to Marketing | Email Templates, click on Add New Template. 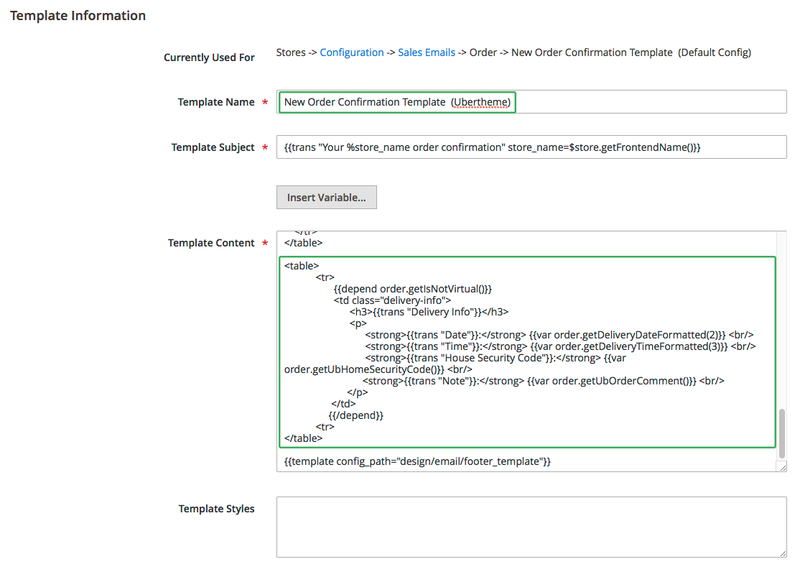 Select the New Order(Magento/luma) as default template. 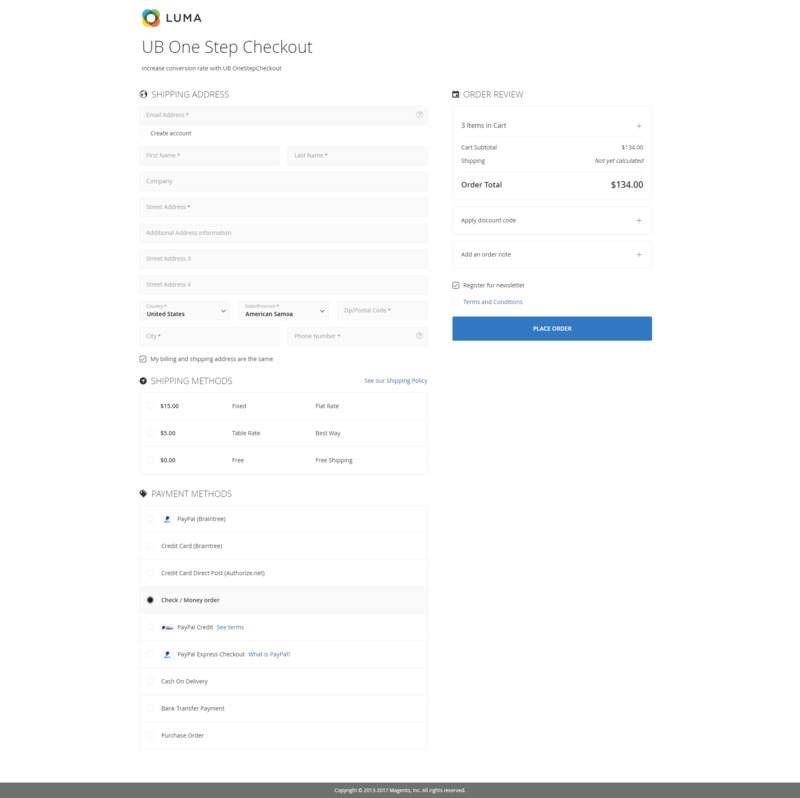 Since we’re using the Luma theme for this guide, we choose New Order (Magento/luma) as our default template. Give the new e-mail template a suitable name. 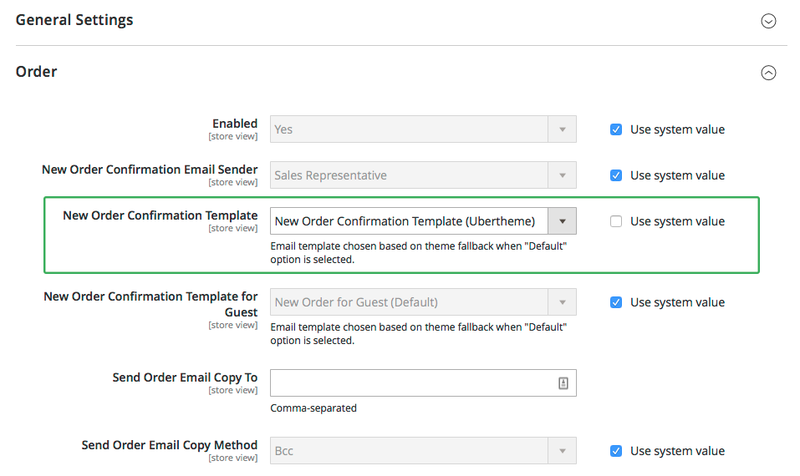 For the demo purpose of this guide, we use New Order Confirmation Template (Ubertheme). Template Styles: If you wish to add CSS styles to this e-mail content, you can add the CSS styling in this field. Once you have inserted the code, you can save it by clicking Save Template. Step 2: Assign this e-mail to the appropriate sales email. Go to Stores | Configuration | Sales | Sales Emails. 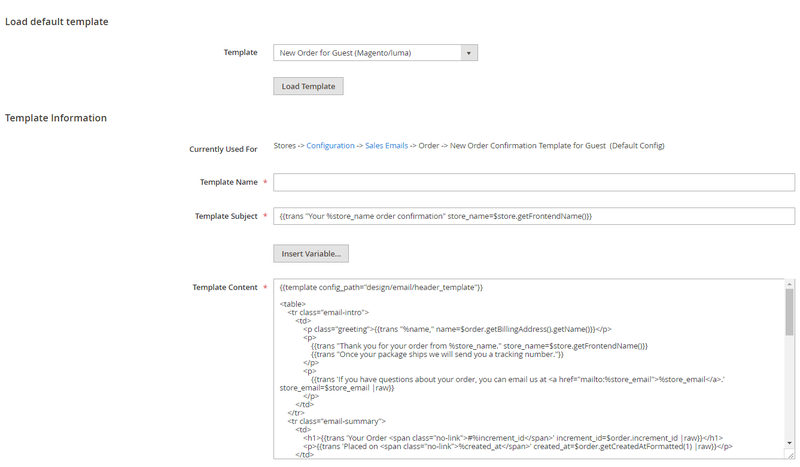 Expand Order panel, uncheck New Order Confirmation Template checkbox and select E-mail template which you just created above. To include Delivery Date & Time in other transactional emails, simply follow similar steps above. 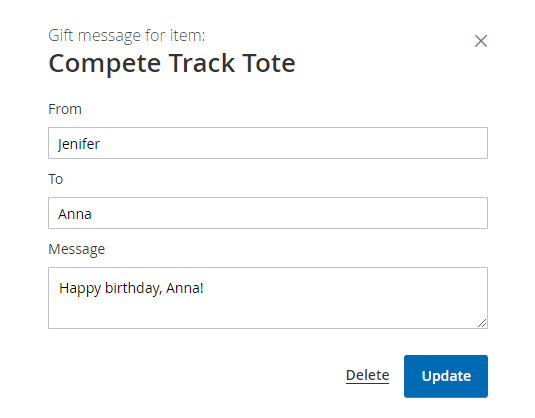 Gift Message and Gift Wrap are the new features released in the UB One Step Checkout ver 1.0.3. These options allow customers to include free gift message(s) at the checkout page which will be usually printed on the packing slip. If customers want to add a special touch to their gift, they can add gift wrap option as well. Both Gift Message and Gift Wrap are optional settings. 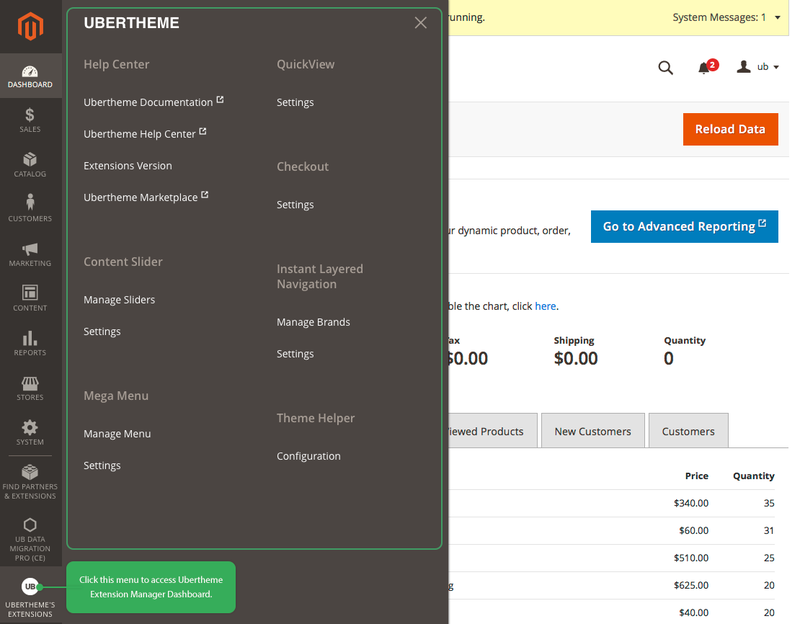 Go to Store | (Settings) Configuration | Ubertheme | UB One Step Checkout, navigate to Advanced | Gift Message and Gift Wrap section. 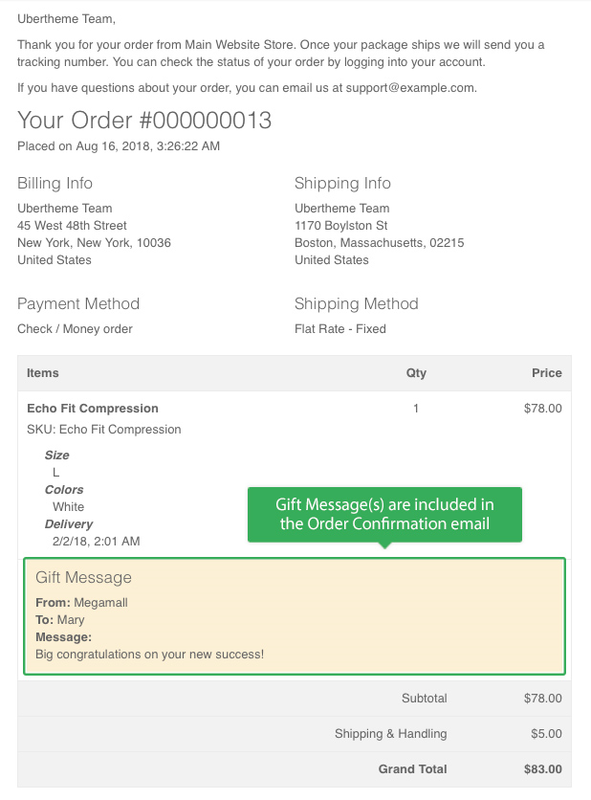 Uncheck Gift Message Option checkbox and select one of the three setting options -- Apply per Order, Apply per Item, or Apply per Order and Item. 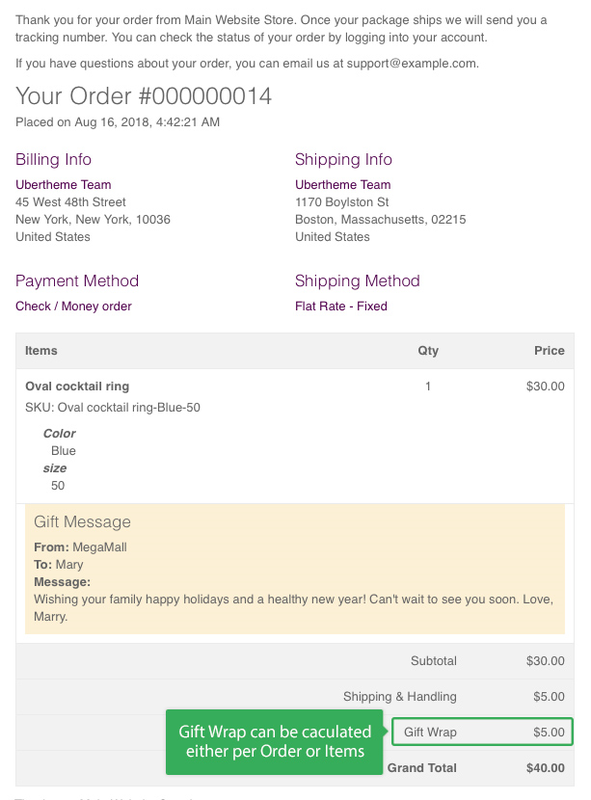 If Apply per Order and Item is enabled, you will see Add a Gift Message checkbox and Gift Message links under every single product items on the Order Review block (providing that the Allow Gift Message option is enabled in each product setting -- You can check by going to Catalog | Products, click on a product and navigate to Gift Options section). NOTE: The UB One Step Checkout automatically syncs the functionality with default Magento 2’s Gift Message settings. That means when you turn on the Gift Message on UB One Step Checkout, the Gift Options of Magento 2 is also enabled by default and vice versa (you can check by navigating to your Admin | Stores | (Settings) Configuration | Sales, then click the Sales section, check the Gift Options). Here is an example of the storefront when enabling Apply per Order and Item. You may be able to add different gift messages for each product item, just click the “Gift Message” link under each product item and enter your message. Besides, you can also update or delete each message. Customer can also log in My Account | My Order dashboard to view all of the Order history. Uncheck Gift Wrap Option and select one of the Gift Wrap types -- Calculate per Order or Calculate per Item. Once Gift Wrap Option is selected, Wrap Fee Amount field will appear accordingly. By default, Wrap Fee Amount is 0. You can enter the gift wrap fee you want. NOTE: The gift wrap fee will be applied per the total order amount if Gift Wrap Option ‘Calculate per Order’ is selected; or per each product item, if Gift Wrap Option ‘Calculate per Item’ is enabled. In case of refund, the Invoice and Gift Wrap fee will be deducted accordingly too. For Shop Owner, he simply navigates to the Order workspace in the backend to see the lists of all current orders. Gift Message and Gift Wrap fee are stored under each order accordingly. Discount Code : Show or hide Coupon Code block in the checkout page. If enabled, you can select Display in Payment Method or Display in Order Summary to display the Coupon Code block under Payment Method block or Order Summary block. Order Note : The Order Note block allows you to collect special instructions from customers about how to prepare and deliver an order. 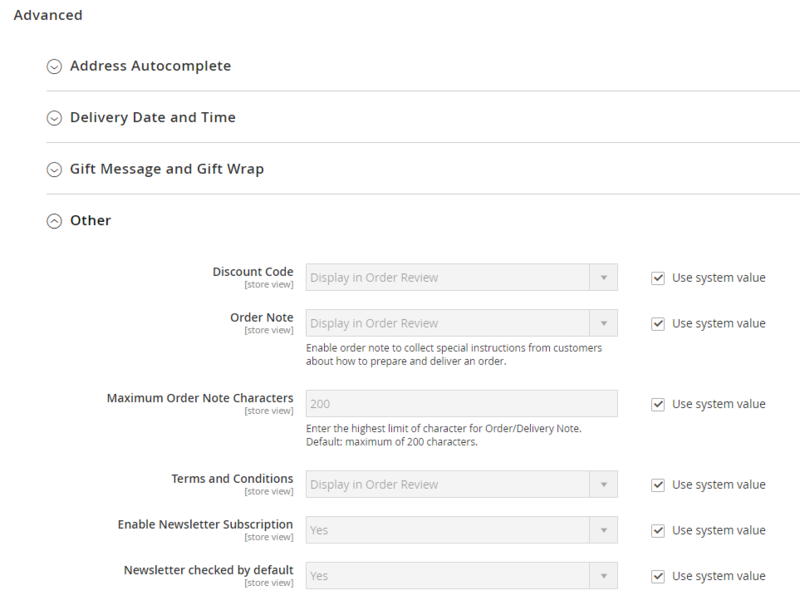 You can select Display in Delivery Time or Display in Order Summary to display the Order Note under Delivery Time block or Order Summary block. Maximum Order Note Characters : Allow to limit the maximum characters of the Order Note. By default, Maximum Order Note Characters is 200. You can enter the highest limit of character you want. Terms and Conditions : It’s similar to the Discount Code block. You can flexibly show the Terms and Conditions under the Payment Method block or Order Summary block. To enable Terms and Condition in the checkout page, navigate to your Magento backend | Stores | (Stores) Terms and Conditions. Click ‘Add New Condition’ button to create your Terms and Conditions content. The Enable/Disable Terms and Conditions setting is auto synced between UB One Step Checkout and default Magento’s setting. For instance, if you enable the Terms and Conditions in UB One Step Checkout’s setting panel, the ‘Enable Terms and Conditions’ under Stores | Configuration | Sales | Checkout is enabled as well, and vice versa. Step 1. Navigate to the Admin sidebar | Stores | Configuration | Sales | Checkout. Then, expand the Shopping Cart section. Step 2. Uncheck Configurable Product Image checkbox and select Product Thumbnail Itself. Step 3. Click Save Config. Once done, when customer changes the attributes (e.g. color) on the one step checkout page, the product variation’s thumbnail will be changed accordingly.